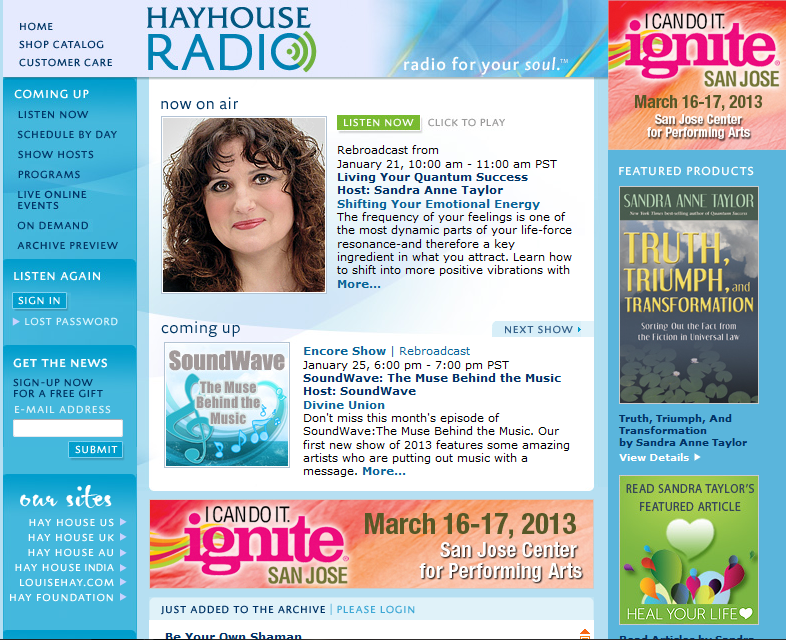 I'm a big fan of Hay House Radio, also referred to as radio for your soul. It is owned of course, by author and speaker, Louise Hay. Each day, there are spiritual speakers such as Esther Hicks, Wayne Dyer, Thomas Moore, Sonia Choquette, Debbie Ford, Doreen Virtue....I could go on and on, there are so many. Spiritual radio hosts are put on a regular rotation throughout the week and best of all, it doesn't cost you anything to listen. My personal favourite is Esther Hicks but like I said, you're spoiled for choice. Just click on the 'spiritual speakers' link and it will take you to the page of show hosts. If you haven't enjoyed Hay House Radio before, I urge you to find a speaker or topic that interests you and listen in.